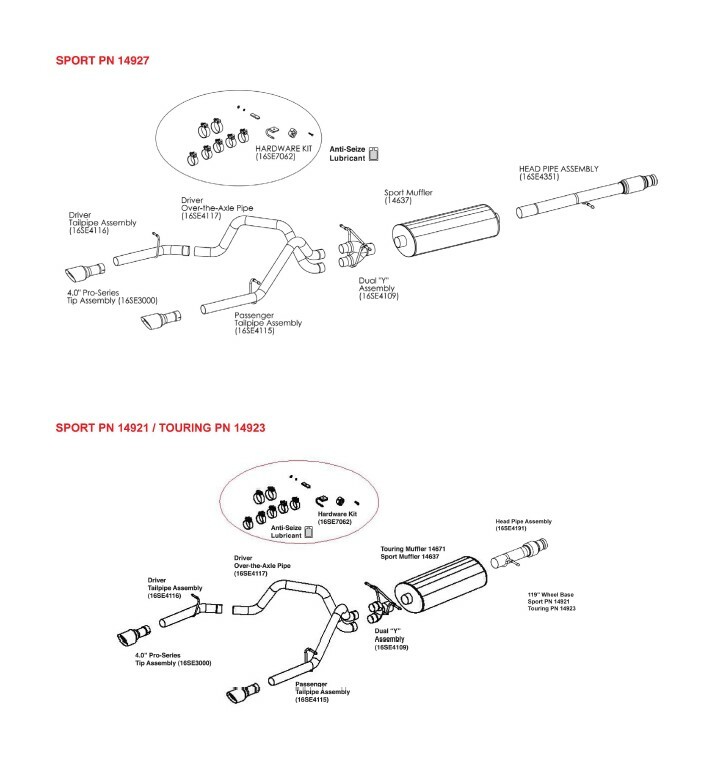 CORSA recommends that installation of this system be performed by a qualified service center or professional muffler installer who has the necessary equipment, tools and experienced personnel. However, if you decide to perform this install, the use of a hoist and an additional person will be required. 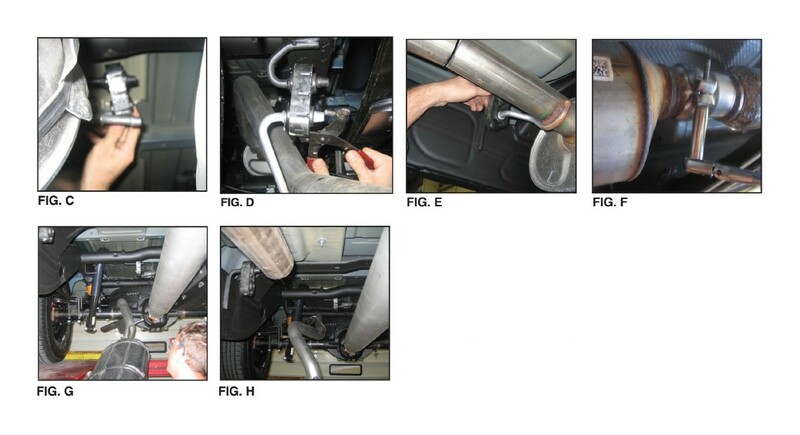 3) Remove the hangers from the grommets at the muffler exit, near the spare tire and finally ahead of the muffler, using grommet pullers or similar device. (See Fig's C, D & E) Note: Using a soapy solution on the grommet hole will make the job easier. 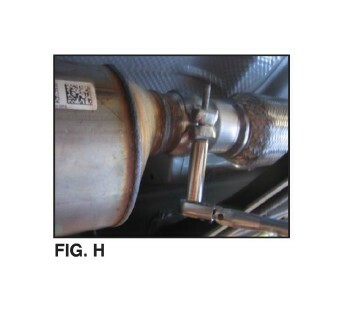 1) Locate the CORSA Head Pipe assembly and slide the spherical joint onto the factory pipe. 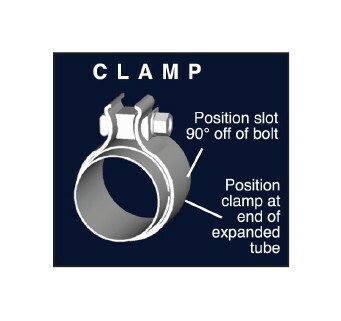 Reuse the factory spherical clamp and loosely snug the spherical joint. Insert the hanger into the factory grommet. (See Fig. H) Note: Using a soapy solution on the grommet hole will make the job easier. 3) Slide a supplied 3" TORCA clamp over the inlet of the CORSA Dual "Y" Assembly and insert over the muffler exit and place the hangers into the factory grommets. Pre-tighten the clamp. (See Fig's L, M, N, & 0) Note: Using a soapy solution on the grommet hole will make the job easier. 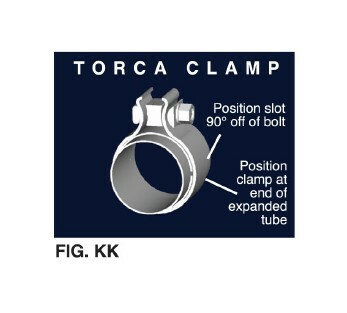 4) Slide a 2.5" TORCA clamp over the passenger side tailpipe assembly and place the pipe onto the upper end of the Dual "Y" Assembly and insert the hanger into the factory grommet. Pre-tighten the clamp at this time. (See Fig's P, Q, R, & S) Note: Using a soapy solution on the grommet hole will make the job easier. 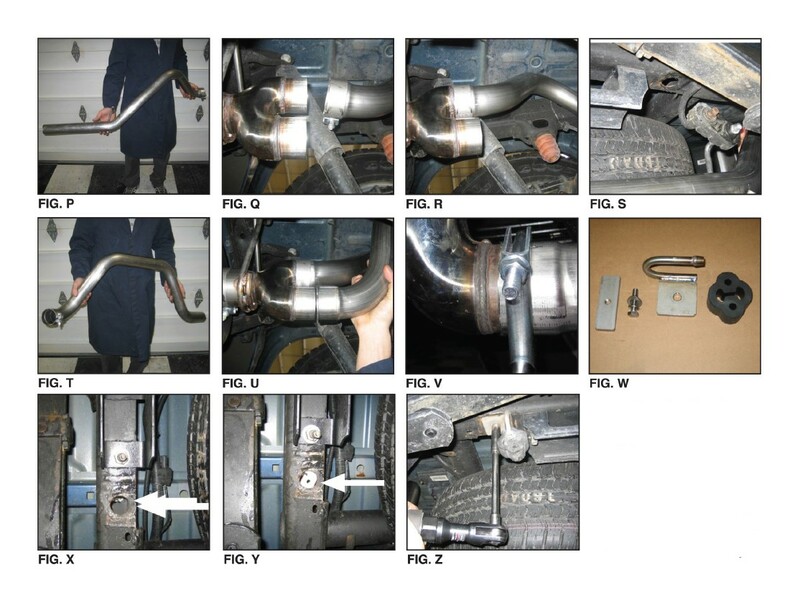 8) Slide a 2.5" TORCA clamp over the inlet of the drivers side tailpipe and install tail pipe onto the over the axle pipe (See Fig's AA, BB & CC). Insert tail pipe hanger into provided rubber grommet and pre-tighten clamp at this time. Note: Using a soapy solution on the grommet hole will make the job easier. 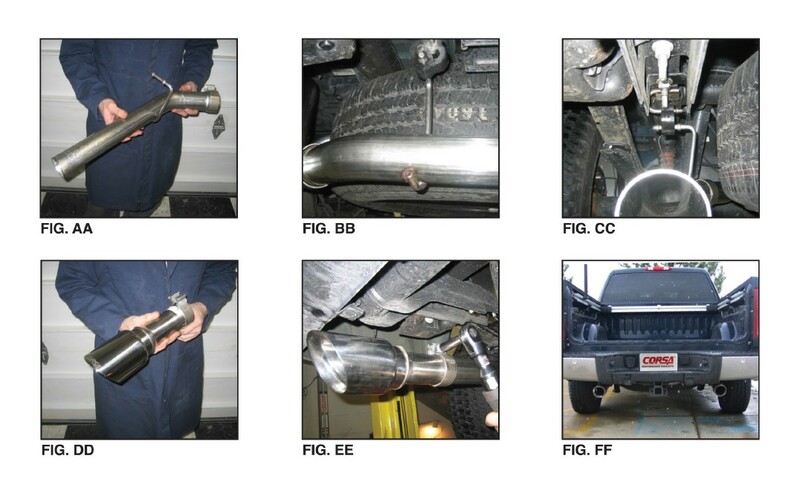 10) Check the alignment of tail pipes and tips. (See Fig. 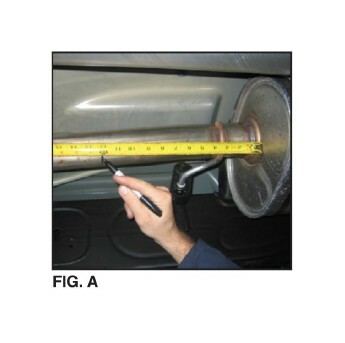 FF) Make sure there is at least 1.5" clearance between the tips and bottom of the bumper. 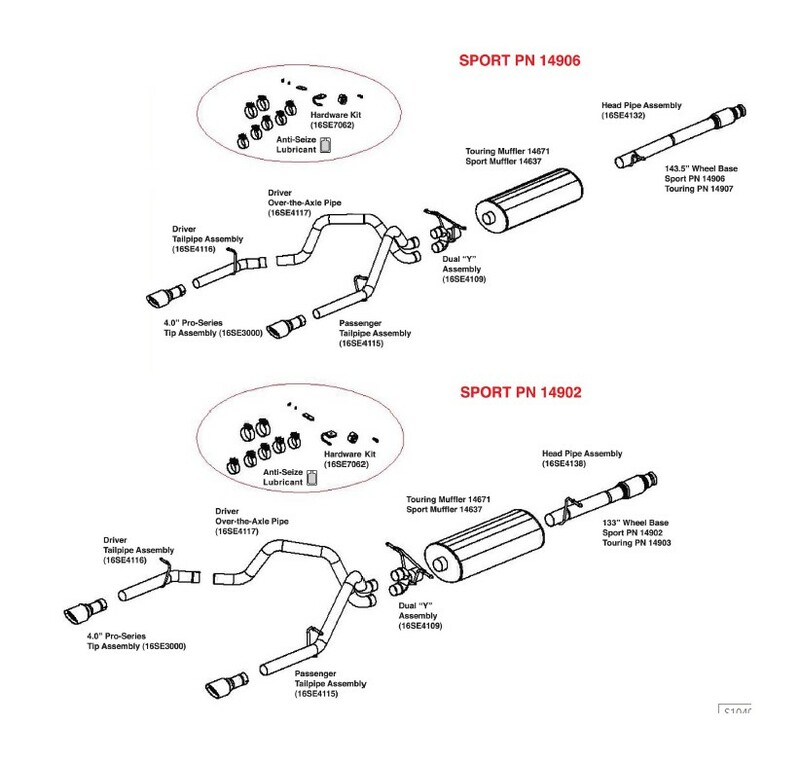 Align tail pipes if necessary by making adjustments at the slip joints. 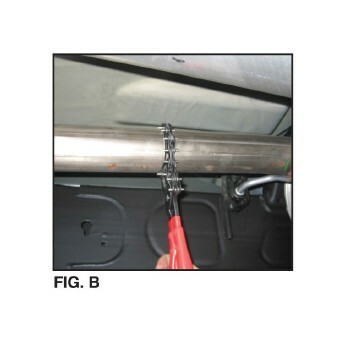 12) It is strongly suggested that all clamps be checked and tightened if necessary after road testing the vehicle and after the system has cooled. NOTE: During cold weather start-ups, you may experience an exhaust sound that is deeper and louder in tone than usual. This is temporary and will diminish to normal levels once your engine has reached its normal operating temperature. NOTE: Immediately following the installation of your CORSA exhaust system, you may experience a trace of smoke after initial start-up. DO NOT be alarmed. The smoke is caused by the burning of a small amount of forming oil residue used in the manufacturing process.